LHC carried out a review of the Vision for Taunton to produce a ‘refreshed’ deliverable masterplan that takes into account the current economic climate. We worked with stakeholders and partners to understand the constraints, people’s aspirations for Taunton and to develop an enhanced Vision that focused on Taunton’s unique assets, and in particular the area between its railway lines and its forgotten waterfront. The revised masterplan sets out the framework for development on key strategic sites, creating a connected network of pedestrian routes that link into existing green spaces and sustainable transport routes. The original Vision for Taunton, which was developed in the early 2000s, proposed extensive regeneration of the town centre and a new focus on the waterfront. The Vision proposed a series of developments, with large scale employment, theatre and high density residential accommodation. 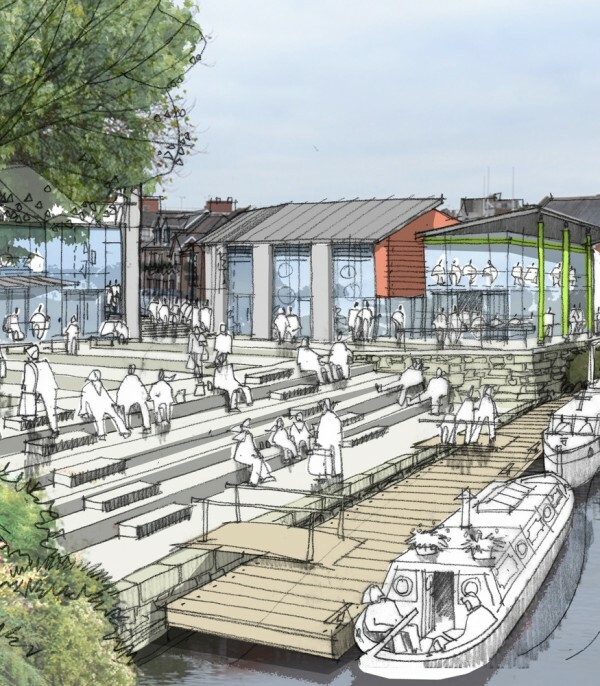 Funded by this development, the existing poor quality public spaces along the water’s edge would be enhanced to create connected routes and a new waterside focus for Taunton town centre. Taunton Deane Borough Council achieved a number of significant successes since the adoption of the Vision, but the economic crash prevented delivery of the main development proposals. As a result, large areas of Taunton’s waterfront have been left vacant or blighted by inappropriate uses. Delivery of the Vision stalled and the Council decided to commission an urban design team to review and refresh the masterplan. Key requirements of the brief were that LHC should work with commercial partners (Alder King) and stakeholder engagement professionals (Fresh Communication) to deliver a realistic, deliverable masterplan to a tight programme and budget. It was essential that the refreshed masterplan should be viable, with appropriate uses to support the development of the town centre. 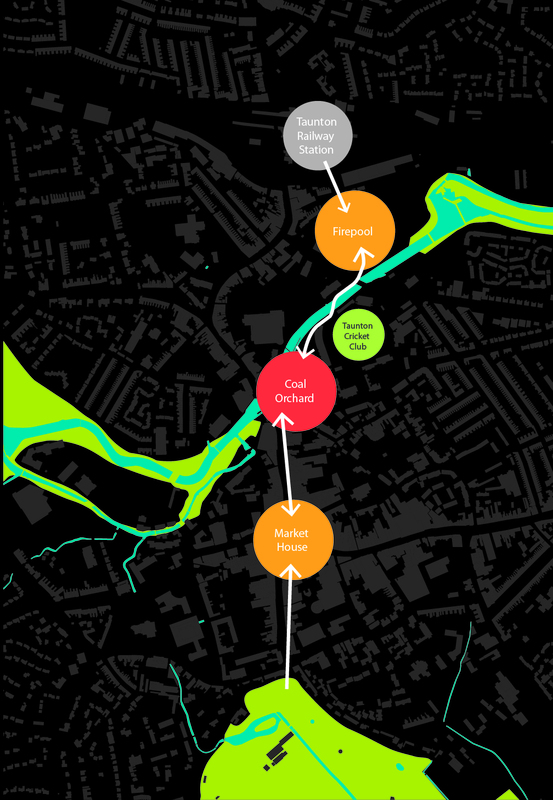 During extensive stakeholder engagement the common thread which emerged was the importance of the River Tone to Taunton. A key part of the refreshed Vision generated by LHC from these consultation meetings was the delivery of an enhanced waterfront that connected the town centre to its context, and placed the River Tone waterfront at the heart of the regeneration of Taunton town centre. In developing the refreshed Vision the team also identified that, despite the challenging retail and commercial marketplace, Taunton’s growing population (predicted to increase from 65,000 to 85,000 residents over the next 20 years) had the potential to strengthen the town centre’s position as a regional hub. To capitalise on this growth Taunton must address changing retail demands. The retail offer needed to be strengthened to enhance Taunton’s attractiveness to retailers and shoppers, and the town centre needs to provide a mix of activities, including leisure, employment and housing, and high quality streets and spaces, to encourage visitors to spend longer in the town and support multi-purpose visits. 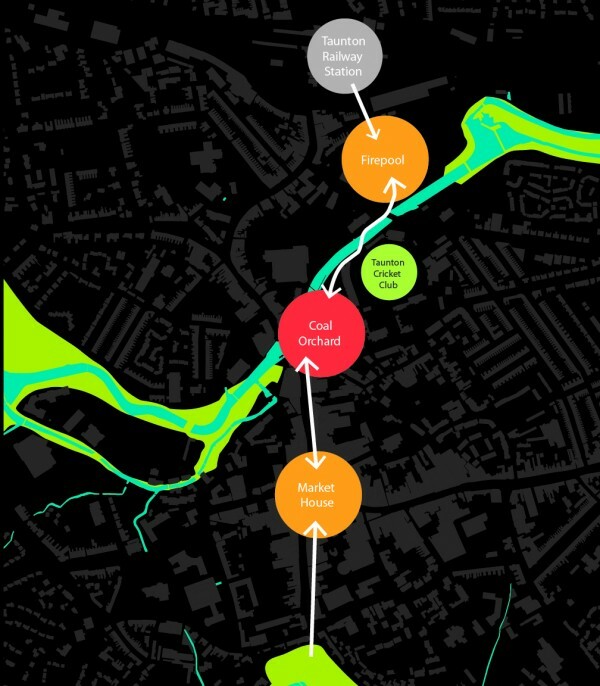 The existing green connections into the town need to be joined up through the creation of pleasant and attractive pedestrian and cycle routes along the River Tone. A high quality north-south pedestrian route, from the Railway Station to the High Street, is proposed to activate the waterfront, allow people to move safely along attractive routes through the compact town centre and join up the key development sites. The east-west green corridor and the north-south pedestrian route intersect on the waterfront at Coal Orchard; concentrating activity at the heart of an expanded town centre. This key place should become a focus for activity; a beautiful place on the river with cultural activities, cafes and restaurants, artist’s studios and galleries, and active use of the river. Redevelopment at Firepool will provide capacity for the town to meet the needs of an increasing residential population, and increase Taunton’s attractiveness to investors. A high quality mixed use development will generate activity on the waterfront and provide a new gateway to the town centre from the north. The existing retail core around the Market House will be enhanced to create a pedestrian dominant area with street markets, cafes and a mix of activities. Outline proposals were developed for each key area – with a focus on the key waterfront development opportunities at Coal Orchard and Firepool. The final part of the Rethink process was to set out a Delivery Strategy to guide stakeholders and partners on the actions required to progress the refreshed masterplan, and the key steps required to overcome barriers and deliver regeneration; with a series of quick wins proposed to generate momentum and secure wider public support. This was developed in partnership with Taunton Deane Borough Council, who are now putting in place appropriate delivery and governance arrangements to deliver the Vision as one of the Council’s key economic growth objectives. Taunton Deane Borough Council commissioned LHC to carry out an independent ‘rethink’ of Taunton Town Centre, focusing particularly on refreshed plans for a number of key sites which had not come forward for development over recent years, due to changed market conditions. LHC worked closely with commercial advisers and communications experts to bring forward a refreshed vision which is both inspiring and commercially deliverable. The Taunton Rethink was endorsed by the Council in January 2014 and is supported by key stakeholders throughout Taunton – no mean feat given the divergence of opinion over the future of the Town.